This particular farmer's market meal was the product of not one, but two farmers markets. My new favorite Saturday morning routine consists of an 8:30am cardio barre class at the newly opened Barre East and a trip to the West Frederick Farmers Market. I am also a big fan of the Sunday Frederick City farmer's market in downtown Frederick though and had to make a trip on opening day. Between the two markets I had amassed a bunch of asparagus, spring onions, nitrate free bacon, raw garlic dill cheddar cheese and a few other things. Ok, a few other things means three varieties of Glory Doughnuts but those were gone long before this pizza was even a twinkle in my eye. Preheat the oven to 500 degrees Fahrenheit at least a half hour before you'll be cooking the pizza. Divide the dough in half and roll each out on a piece of parchment paper. Drizzle each with a 1 tablespoon+ of good olive oil and spread it evenly over the dough. 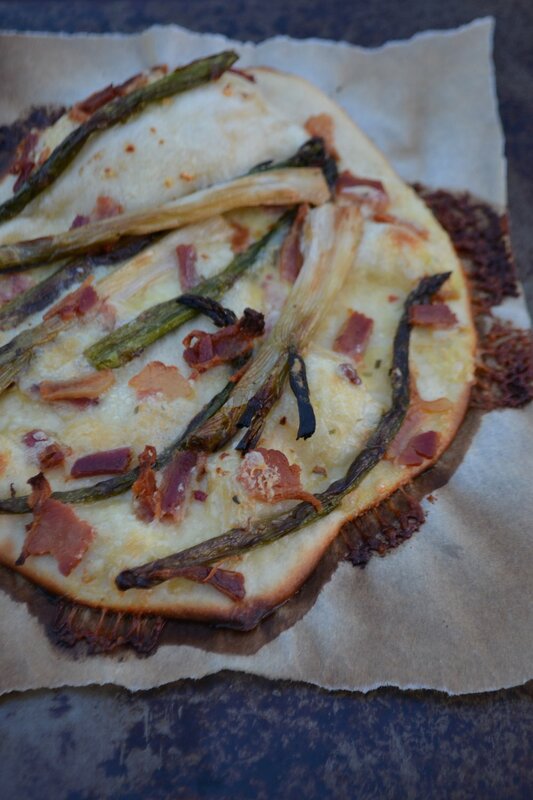 Then top each with the asparagus, spring onions, cheese and bacon. Slide the parchment papers/pizzas onto two baking sheets and place in the oven for 5 minutes. At the five minute mark, rotate the pizzas 180 degrees and if they're on different racks switch that too. Bake for another 3-5 minutes until the crust is golden and the cheese starts to get a little bubbly. The pizza will easily release from the parchment paper when you slice it. These pies were split between four people and while we were all perfectly satiated we were still sad when it was finished. The roasted veggies offer a slightly sweet flavor that matches very well with the smoky bacon and strong cheese.